Has Navalny’s Mayoral Challenge Transformed Russian Politics? Today (8th September) Muscovites go to the polls in what is one of the most fascinating elections in Russian history. That sounds a bold statement, but when you consider that ‘free’ elections have only existed in Russia for a little over twenty years and that most have been a foregone conclusion with little competition, you realise that it’s not actually saying much. Perhaps the only other comparison is the election for Yeltsin’s second term in 1996, a battle which had its own fair share of swindles and conspiracies. However, this election is peculiar not just because of the candidates involved but also due to the circumstances surrounding it, the seemingly new methods of electioneering, and the potential for the ushering in of a brighter future in the world’s largest country. 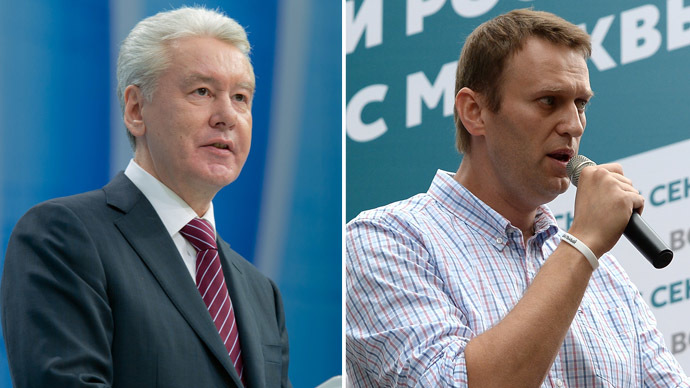 The 2013 Moscow Mayoral election, the first in the capital for ten years, pits incumbent and Putin-backed favourite Sergei Sobyanin against Alexei Navalny, a man who just two months ago was sentenced to five years imprisonment for embezzlement. Observers are still scratching their heads as to why Navalny was released on bail the day after his sentencing, allowing him to unexpectedly take part in the contest. Theories range from conflicting support amongst the power elite to the concept of creating the façade of a real contest to provide the expected victor with greater legitimacy. The only thing we’re certain of is that Navalny has been allowed to contest the election, and that has transformed it. Taking his inspiration from Western election campaigns, he has flooded Moscow with bands of young enthusiastic volunteers, under the banner of ‘Change Russia – Start with Moscow”. The prospect of this change is exhilarating, albeit a regular injection of reality is needed to remind oneself of the limitations. It is not easy to assess if his campaign has worked as effectively on the ground as it has in the Western media, who tend to deify any non-Kremlin individual. As a veteran of political campaigning in the UK, I find Navalny’s approach impressive and in-keeping with what fellow politicos would come to expect from seasoned electioneers. He has perfected the ‘staring intently into the middle distance’ pose in his posters which help to project him as a visionary, whilst his adverts and photo-calls paint him as the normal family man which you’d expect to see on a breakfast cereal commercial. He has ditched the politician’s suit in favour of open neck shirts with rolled up sleeves or polo shirts, in contrast to his formal looking opponents. His activists are young and spritely, energising those they hand leaflets to, whilst other candidates surround themselves with dour looking heavies. But interestingly, whilst we might be used to this approach in the UK, it is not how things are usually done in Russia, where it isn’t as easy to break through the greyness that usually characterises its domestic politics. “That election poster is hilarious!” says Evgeniya, a 29-year-old professional who recently returned to Moscow after several years working in London. “He looks like he is waiting for aliens to land!” Nor does his wider campaign impress her… “It is too American for us. It’s so sugary it makes my teeth rot”. Yet you can’t deny the impressive reach that Team Navalny has achieved… “They’re on every street corner, you can’t avoid them” she says. 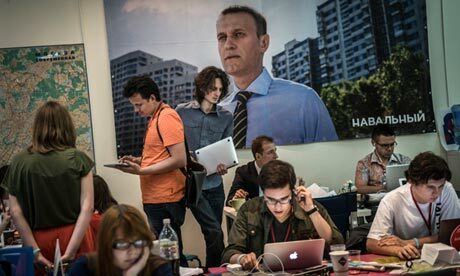 Navalny has a core team of about twenty activists, supported by an office of around one hundred and an army of several thousand activists out on the street. Yet such masses of followers cannot necessarily overcome a central problem of perception. Referring to Navalny as being “like a robot” her Muscovite friend Alexander asserts that “most Russians do not trust him. They think he is too fake and are not blind to where his money has come from”. He is alluding to the allegations of American funding which caused one other candidate, the ever-aggressive Vladimir Zhirinovsky, to propose the filing of a complaint to the Prosecutor General. Whether actual money has come from such sources, it is clear that knowledge, expertise and influence has. Visionary posters and leaflets aside, he openly admits that several of his policy ideas came from watching US TV show ‘The Wire’. There is also a danger that in concentrating all our attention upon the remarkable travails of Navalny, we neglect the possibility that the front-runner Sergei Sobyanin may have genuine popularity. “Most people will be voting for Sobyanin regardless, it seems like he has done a lot, there are visible changes in Moscow particularly in public spaces like parks, and he has hired people from abroad to advise on things like the transport system” Evgeniya tells me, referring to the apparent ‘beautification project’ and Boris Bikes that have made an appearance in recent years. In many ways the fact that such a spotlight has been placed upon one man – an individual not without his fair share of shady experiences – is a sad indictment of the state of Russian politics and an indication of why his campaign is so important. The history of Russia and the chaos of the 1990s has left people confused by politics, uncertain about their rights and liberties. Navalny has shone a torch upon this dark path, showing Russians that they have a right to ask their representatives questions and to demand answers about where their money goes. Yet fighting corruption and pointing fingers is one thing, having a serious coherent manifesto and practical policies is another. Does he stand a chance of winning? Most commentators say he will be lucky to push Sobyanin into a second round run-off by denying him more than 50% of the vote. Current polls place Navalny at around 20%, although one member of his team tells me that they’re on at least 30%. Yet the likely victory of Sobyanin is liable to be something of a pyrrhic victory, with Navalny losing the battle but winning the long-term war of undermining and potentially overthrowing the entrenched elites which have until now retained power through a heavy hand and popular apathy. “He won’t be allowed to win, if there was any sign of this the corruption charges would be raised again and he would be sent back to jail” says Alexander, echoing the popular conspiracy theory around his prior release. Even a tireless member of Navalny’s central campaign team, a 29-year old blonde beauty typical of his entourage, refutes the suggestion that he can win, conceding that “we are not the majority, and each nation gets the government it deserves”. A mixture of apathy, lack of understanding and the perception that things are better than they were a decade or two ago makes it difficult to stimulate change, but “we need to change that” she adds. Asking if she thinks the election has been ‘fair’, she says “It’s not a fair fight but it makes our work interesting because we have needed to be very creative”. When I ask about the likelihood of electoral fraud she says “it will happen for sure, but it can be overcome if we can secure 12-15 observers at each voting station”. Such electoral observation, common in the West, has become a bugbear in Russia, where Putin has prohibited many international bodies by classifying them as ‘foreign agents’, although official representatives of the candidates are permitted to oversee the counting of votes. Russia is clearly still a long way from anything that we are used to seeing in the West, but the Moscow Mayoral election, bizarre as its circumstances are, show signs of a step in the right direction. Regardless of the result in this contest, the involvement of one man, taking his inspiration from British and American election campaigns, has succeeded in instigating a grass-roots movement that has invigorated one of the world’s great cities and offered a life-line to a generation that felt submerged by a stagnant political system. 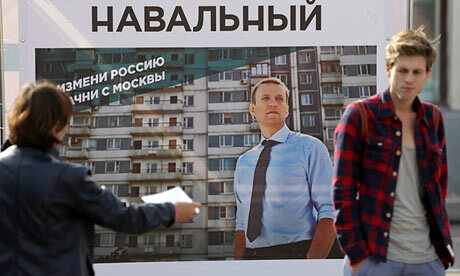 As someone with both a nerdy enthusiasm for elections and a desire to see Russia in a healthier state inside and out, I think the inclusion of Alexei Navalny in the Moscow Mayoral election can only have beneficial consequences for the future.